Wash and trim your swiss chard. Remove the stems and the large center vein (you can do this by folding the leaf in half and running your knife vertically down the side). Chop into pieces. Thinly slice your zucchini. A mandoline is best for this. In a large, wide saute pan heat 1 tbsp. of butter with a splash of olive oil. Medium heat is good. Add your scallions and saute for 1 minute. Add a large handful of swiss chard and saute in batches. As is starts to wilt, you can add more. Your swiss chard is done when it tastes tender, not tough. This should take about about 5-6 minutes. Season with salt and pepper and give it a taste. Using tongs, remove swiss chard from the pan squeezing out any excess liquid. Set aside on a platter and keep warm. In the same pan, heat 1 tbsp. of butter with a splash of olive oil. Add the curry powder and warm it through to bring out its flavor, about 1 minute. Add the zucchini and saute for about 3-5 minutes (the thinner they are, the faster they'll cook). Season with salt and pepper. 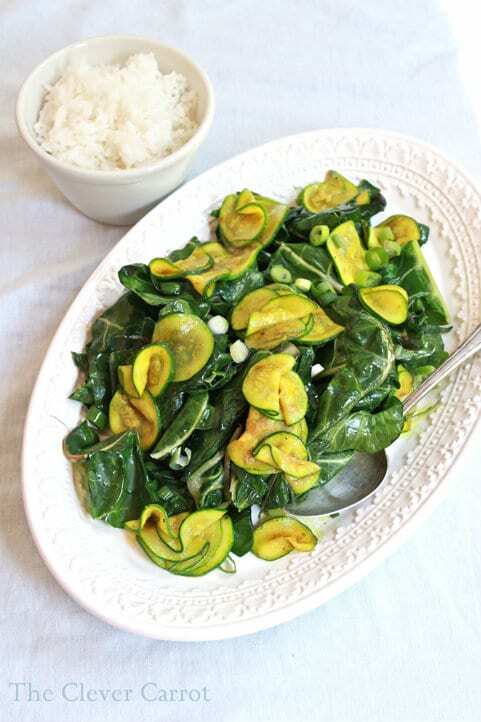 Sprinkle the zucchini over your swiss chard and squeeze some lemon over the top. Serve with extra lemon wedges and jasmine rice if desired. * Only the zucchini are sauteed in the curry powder, not the swiss chard. This keeps the curry flavor mild. * Swiss chard wilts down a lot, so double this recipe to serve more people. Pictures make everything seem bigger!